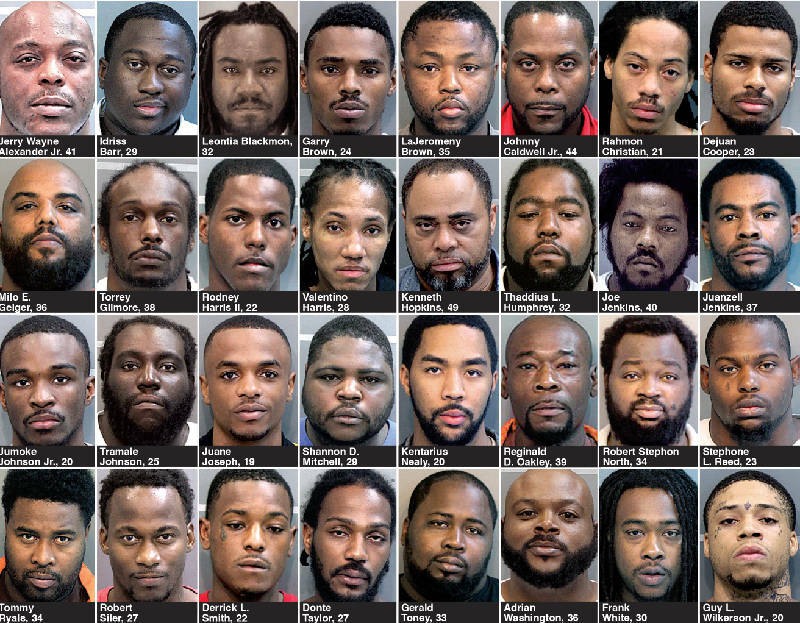 These 32 men that authorities have called the "worst of the worst" criminals in Chattanooga have been tied to more than 300 crimes, from murder to drug offenses and fishing without a license. View a searchable database of individuals' histories covered in this article. Jerry Wayne Alexander Jr., 41; Idriss Barr, 29; Leontia Blackmon, 32; Garry Brown, 24; LaJeromeny Brown, 35; Johnny Caldwell Jr., 44; Dejuan Cooper, 23; Milo E. Geiger, 36; Torrey Gilmore, 38; Rodney Harris II, 22; Valentino Harris, 28; Kenneth Hopkins, 49; Thaddius L. Humphrey, 32; Joe Jenkins, 40; Jumoke Johnson Jr., 20; Juane Joseph, 19; Shannon D. Mitchell, 29; Kentarius Nealy, 20; Robert Stephon North, 34; Reginald D. Oakley, 39; Robert Siler, 27; Gerald Toney, 33; Adrian Washington, 36; Frank White, 30; Guy L. Wilkerson Jr., 20. Rahmon Christian, 21, Tramale Johnson, 25, and Donte Taylor, 27, are charged with being convicted felons in possession of firearms. Stephone L. Reed, 23, is charged with car-jacking, brandishing a firearm during and in relation to a violent crime, and being a felon in possession of a firearm. Derrick L. Smith, 22, is charged with possession of cocaine base ("crack") with intent to distribute. Juane Joseph loves money. He's got photos showing wads and rolls of cash on his Facebook page; he likes people to call him Bankroll Stunna. He watches the dope kings on television's "The Wire," who live the high life on drug profits until they're gunned down by competitors or taken down by Baltimore cops tapping their phones. "Just the reality. It be good, like it be interesting, when you look at stuff like that," he says about the show. Now the 19-year-old has an all-too-real supporting role in Chattanooga's own version of "The Wire," the round-up of 32 men on federal drug and weapons charges after a long-running investigation based at least partly on wiretaps. The goal was to strike at the key figures in Chattanooga's crack cocaine market -- the importers bringing in powder, the dealers moving product, the enforcers unleashing violence for security or intimidation. Of the latest round-up, all the suspects are men. All are black. Collectively they have been connected to 103 assaults, 14 attempted murders, 27 robberies, two murders, 160 drug offenses and 42 weapons-related charges, and hundreds of lesser crimes, a review of court records by the Times Free Press shows. Some charges were dropped -- including eight weapons-related counts, 58 violent crimes including murder and domestic assault, and 39 drug-related crimes dismissed in local courts. "We have worked around and figured out who the biggest drug dealers in Chattanooga are, who's moving the most drugs in and out of the city, who's profiting the most from the drug sales and tied to that, the weapons involved in the drug trade and the violence associated with maintaining the drug trade," said Chattanooga Police Chief Bobby Dodd. Sources say more arrests are coming. But Skip Eberhardt, a former gang leader who now runs a program to help those trying to get out of the gang life, said that while some of the 32 may deserve potential severe sentences if convicted, many do not. And the punishment doesn't end when a prison sentence is over, he said. "Once a kid goes in and does a 10-year sentence, whether it's state or federal, and comes out, he's actually being punished for the rest of his life," Eberhardt said. "The 10 years wasn't good enough. We're going to punish you some more. Why? Because you're not going to be able to find a job." As for all the suspects being black, Eberhardt was discouraged. "It's a shame that we can't get all the blacks to come together in unity to try and protest what they [authorities] are doing," said Eberhardt. "Surely it stands out what they're doing. They know our system don't work out as far as rehabilitation." Their records contain crimes ranging from fishing without a license to manslaughter. Some of the men have violent criminal pasts and are suspected of orchestrating numerous shootings. Together, two-thirds of them have committed violent crimes locally. Out of the 32, at least 18 are convicted felons. Police have kept a watchful eye on Jerry Wayne Alexander Jr. for years. Alexander, 41, has 30 convictions in Hamilton County ranging from theft to attempted first-degree murder. In 1996, he shot at police with an assault rifle during a traffic stop. Last year, he fought police, choking one officer, according to court records. He told police, "you better get more boys, and I'll kill you like I tried to kill another officer." That case is still pending. Now he faces charges of conspiring to distribute 280 grams or more of cocaine and conspiring to distribute heroin. Derrick L. Smith, 22, a Gangster Disciple member, was accused of gunning down Jabari Jennings and another man last year in a drive-by shooting on Fagan Street that one police officer said "was like the O.K. Corral." Jennings died. The case was later dropped because of ballistics issues. Smith has six prior convictions, including possession of a controlled substance, and pending state drug charges. Now he faces a federal charge of intent to distribute crack cocaine. Reginald "Joker" Oakley, 39, counts manslaughter among his 17 convictions. The Rollin 60 Crips gang leader was accused of firing an assault rifle into a crowd in College Hill Courts, wounding three people, in 2011. The charges later were dropped. Oakley, who sometimes goes by Reginald Woods, says he has changed and renounced his gang ties. He called a truce among the city's gang members in March. Oakley now faces charges of cocaine distribution and felony possession of a weapon. Bryan Hoss, an attorney who represents Oakley, said, "The police believe certain suspects are dangerous. They've got this investigation and they've tied them to the drug trade. We'll see if it plays out." Attorneys representing the men are still waiting to see what evidence the task force that included Chattanooga police, DEA and FBI agents has collected since the investigation began in 2009. "We're still trying to figure out what phones were tapped and what was recorded and how my guy got caught in it," Hoss said. Dodd said he doesn't know how many of the cases in the indictment announced Nov. 4 were built on wiretaps. "I know they are used sparingly. They are used within the guidelines of the law," he said. To get a wiretap in Tennessee, investigators have to prove they have reason to believe a suspect has killed someone or is plotting a murder, has committed or plans to commit a gang offense or conspires to distribute 300 grams or more of cocaine. Locally, most drug arrests are built through the use of traffic stops, confidential informants and undercover operations. Wiretaps are much less common. The investigations can be labor intensive and require a judge to sign off. Investigators also have to provide periodic updates about the wiretap to the court. But they are a powerful tool in an investigation. Follow one suspect, he'll lead you to his boss, maybe. "It spider-webs out from there. It shows the organization," Dodd said. Hoss said it's common that suspects indicted and rounded up in federal cases sometimes don't know each other. "You sit down and go through the defendants. And they may know two of the 20 people," said Hoss. Also, not everyone in drug conspiracy cases handles large quantities of drugs. "There's probably only a handful of people in the conspiracy who are responsible for that amount," Hoss said. "I think you'll find people implicated in the conspiracy but responsible for much smaller amounts of drugs." Joseph said he doesn't belong on the list. Though police dubbed the 32 indicted suspects "the worst of the worst," some, like Joseph, don't have felony records or even minor convictions in Hamilton County. His record reflects only a pending charge for driving on a suspended license. But he's part of the street life growing up in East Chattanooga. And those around Joseph were often in trouble. Several years ago, Joseph went to a gas station with Montez Davis when Davis brandished a gun and fired into a crowd, fatally shooting a man. Joseph had gone into the store at the time of the shooting. In 2011, Joseph was among nine people wounded when gang members fired into a crowd of young people leaving a church-operated teen club on Market Street on Christmas Eve. Joseph said he fixes and builds engines to make extra money. On his Facebook page, there are numerous pictures of rolls of money. Some feature his 3-year-old son. Sometimes Joseph is fanning the bills. One shot shows wads of folded twenties filling the entire center console of the car. He said he knows only one other person in the round-up -- his uncle, 34-year-old Tommy "Tommy Gun" Ryals. Both are accused of conspiring to distribute 280 grams or more of crack cocaine and aiding and abetting one another. "I'm just at the wrong place at the wrong time," Joseph said. "I'm a good man. I'm not a violent man. ... I'm not the worst of the worst at all." But once caught in the web, it's hard to break free. "The justice system is so strong and powerful," Eberhardt said. "When they pick a kid up, they already know they're gone 'cause they have nothing to fight with." Dodd said any individual person in a conspiracy case is just one link in a chain. "Say there's five links to that chain and you're one of the links and you've got the least amount of prior history. If you're a link and I can't make the case without you, you're sucked up into the process," Dodd said. "Everyone involved in an organization, if it's a conspiracy [case], you have to bring everyone down." Nabbing someone on the periphery or even high-level offenders looking at serious time can help build more cases, Dodd said. There are deals to be made. The federal system offers no parole. Joseph said no one has approached him to make a deal. Snitch and there will be retaliation -- that's the street code. "I don't have anything to talk about. I don't know what's going on," Joseph said. But someone on the list will talk. They'll sing to be set free. "You'll see when you're not looking at an 11-month, 29-day suspended sentence [in state court] -- you'll see a lot of souls, a lot of breakdowns and a lot of changes," Dodd said. "A lot of folks come to the foot of the cross because when you're sitting there looking at a life sentence ... or 28-year sentence, what else do you have left?" Contact staff writer Beth Burger at bburger@timesfreepress.com or 423-757-6406. Follow her on Twitter at twitter.com/abburger.